A lot of people are not very happy with Dan Le Batard's decision to turn his Hall of Fame ballot over to Deadspin readers. His fellow ESPNers, Tony Kornheiser and Mike Wilbon, made that clear enough yesterday on air. Here's what some writers have had to say. Instead of, "Dan LeBatard is Highly Questionable," a more appropriate name would be, "Dan LeBatard is Petulantly Arrogant." By handing his Hall of Fame vote to the internet site, Deadspin, which polled its readers and then voted with LeBatard's ballot, LeBetard resorted to tactics beneath even the most spoiled child on the playground. Rather than take his ball and go home, LeBatard brought a whole bunch of kids along to disrupt the game by playing with a completely different set of rules. Hall of Fame voting is the exclusive privilege of 10-year-and-up members of the Baseball Writers Association of America. Fans don't get to vote, and it's a different argument as to whether they should. Theoretically, reporters who cover the game on a daily basis are better-informed than fans who follow the sport from afar. Whether that is correct or incorrect isn't the issue here. I have known Dan Le Batard for a long time, and I hardly think he is a "scumbug," [sic] which was my initial label for the voter who turned over his ballot to Deadspin. Why? Well, it will gain Le Batard a ton of publicity today, drawing attention to his various ESPN shows. Sorry, Dan, but that had to factor into your decision. Also, Dan, if you are so disturbed about the process, why did you use Deadspin as a vehicle? Surely, you have plenty of your own platforms to get out your message. All in all, it just seems to me by undermining the process, Dan, you sold out your fellow members of the sportswriting fraternity. Yes, the process is flawed, but your stunt also reflects poorly on people you've shared the press box with for years. There are better methods if you truly wanted reform. Bottom line: The whole thing just doesn't strike me as something a serious journalist would do. And I've always thought of you as a serious journalist. Again, serious journalists don't do something like this, which is disappointing because I consider LeBatard a serious journalist. The website obtained one vote — one out of 571 — in an effort to make "a farce and mockery of the increasingly solemn election process." Further, it likened some BBWAA voters to "attention-seeking trolls." 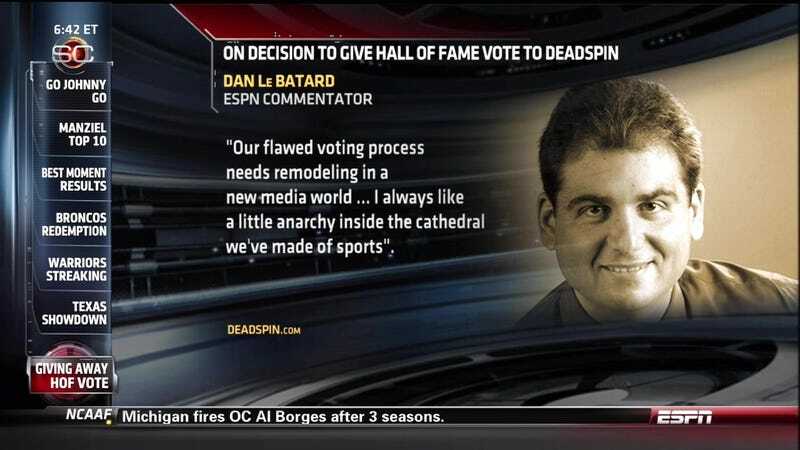 Well, then, what exactly is Dan Le Batard, who turned over his ballot to Deadspin and got plenty of attention for explaining that his vote has "gotten pretty worthless in the avalanche of sanctimony that has swallowed it." What exactly is Deadspin, for that matter? If Le Batard no longer wanted to vote, he could have resigned from the BBWAA and spared us his sanctimony. The wildly talented Dan Le Batard of ESPN turns out to be the voter who chose to mock the system by turning over his vote to a website that exists solely for the purpose of embarrassing people. A lot of hard-working men and women have been involved in this process for 75 years, and like the rest of us, Le Batard was fortunate to be included in the process. Effecting change from within is difficult. Anonymous betrayal and ridicule is easy. A stand-up guy would have recused himself. The BBWAA vote is broken! Thanks Dan. We knew that, so what was your goal? Two quick thoughts: 1) I love, love, love that Deadspin today refers to some voting writers as "attention-seeking trolls," a blindspot in self-awareness by a website that leads the league in self promotion. 2) I love that my buddy Dan must now act as if he'd have preferred none of this get out when in fact this is publicity gold, effing gold, for somebody with a daily radio show who fancies himself a cutting edge establishment-tweaker. I think the fans should have a say in the Hall of Fame. I don't think the fans should have the WHOLE say — like a fan vote for the Hall of Fame — but I do think there should be fan input into the thing. I also think there should be broadcaster input. I also think some of the people who have spent their lives studying and playing the game should have input. I mean, seriously, Bob Costas and Bill James and John Thorn and Tom Seaver and Brian Kenny and Tom Tango and Keith Olbermann and George Will couldn't add to this process? I'm not sure "The people should have a say" was really the point of the Deadspin experiment or if it was more a way to kick and mock the BBWAA while getting some attention. Either way, that point pushed through for me. asked fans on their opinions of Biggio because I was on the fence for that particular ballot. I voted for Biggio in large part because of what you guys told me. This year, I asked for your opinions on Kent as a first-ballot Hall of Famer, and it was a fan who actually pointed out to me that Kent might be at risk of falling off the ballot because of how stuffed it was this year. And that really swayed me into voting for him regardless of how I felt about him as a first-ballot guy. There's a difference between that and handing your ballot to a website whose principal purpose is to ridicule the work of others — and somehow do something important once in a blue moon. LeBatard this year was the classic example of LOOK AT ME!!!!!!!! And to hide behind the whole charity thing. Amazing.